It’s a little less than two weeks before Christmas and I’m seated in the River Run Centre, just two rows from the front of the large stage. Toronto’s Faith Chorale has sung a syncopated, a cappella first verse to their gospel version of “Hark! The Herald Angels Sing,” quite unlike any I’ve heard before. Then the chorus leader, Sharon Riley, comes forward, walking with a cane and a pronounced limp, the result of a devastating car accident 25 years ago. They alternate this penultimate phrase while Riley repeats the entire third verse, line by line, on her own. Her energy is irrepressible and her vocal power astounding, transcending her partially disabled body and filling the hall with wonder. How is it this music can hold such appeal, extending a reach that goes well beyond the Christian faithful? 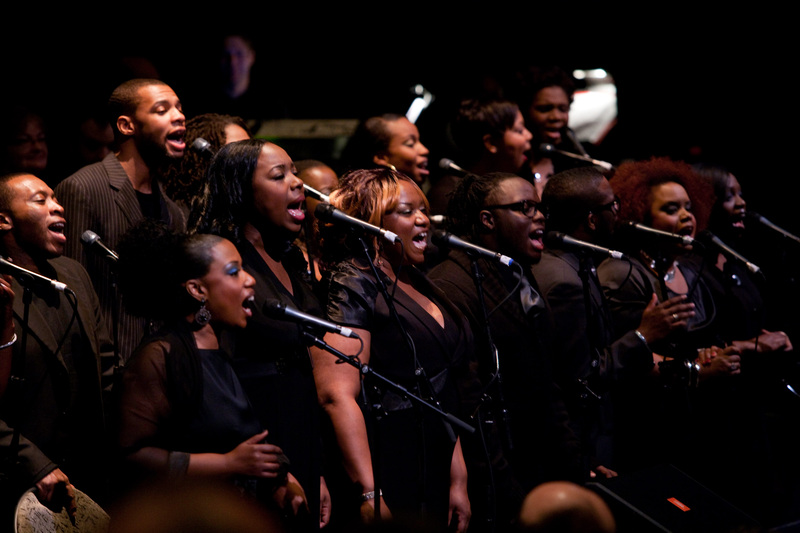 Faith Chorale, Canada’s pre-eminent gospel choir, sings with utter religious conviction, there’s no doubt of that. But it doesn’t feel exclusive. They do it with an openness and love that could resonate with anyone, I think. That was the aim of Guelph musician Andrew Craig, who first conceived and arranged The Gospel Christmas Project ten years ago for CBC radio and television, and has performed it everywhere from the National Arts Centre in Ottawa to Massey Hall in Toronto. It has also been staged four times in Guelph, including the last three years at the River Run Centre, and is being performed there again this year, on Dec. 20. We have a large number of choices when it comes to Christmas music performance in Guelph. I talked to a number of local musicians in addition to Andrew Craig to hear about their upcoming plans, and also to gather their views on the value of Christmas music. The oldest of the regularly performed concerts in town is “Messiah,” which has been staged for over 20 years by the Guelph Chamber Choir, led by Gerald Neufeld. It’s been a staple at the River Run Centre ever since the facility opened 18 years ago. He says that performing Handel’s popular oratorio every December is like “greeting an old friend, but getting to know it in a different way each time.” The professionals he conducts in the string orchestra and the four soloists who perform at the front of the stage are so familiar with “Messiah” they “don’t have to learn the notes” and are free to interpret it afresh each year. They can “bend, pause, stress and add colour” in a way that expresses the emotion of the music in a personal way. He refers to “Messiah” as “salvation history” and says it was initially written by Handel to be performed at Easter, focusing more on the resurrection than the birth of Christ. But he thinks it’s accessible to anyone, even those not familiar with the biblical texts it’s based on. Is it opera, I ask him? “No, but it uses some of the same techniques,” he says. The story is told through song. But the singers are not playing individual roles, they don’t act, and lots of the story is told through the choruses, of which there are many. “Messiah” was written and became popular when operas were failing, according to Neufeld. Handel, a German with a career background in Italian opera, wrote “Messiah” while living in Britain based on English texts, which appealed to a whole new English and Irish audience in the mid-18th century. It has since become one of the most widely performed choral works in the world. Two years ago, the chamber choir began a new tradition, in partnership with Family and Children’s Services of Guelph and Wellington County — a singalong “Messiah” performed the day after the River Run concert, in St. George’s Church just up the street, on Sunday afternoon. It’s a somewhat abridged program and completely different in format. The choir is seated among the audience in the sanctuary, with the soloists close by. People can sing along from a borrowed score, just follow the music or simply listen. But in any case, the experience is participatory. “Everybody is singing on the same page,” says Neufeld, “bringing their individual emotions to the collective endeavour.” He describes it as a “cathartic” experience. The singalong version is different in other ways. It’s not a ticketed show, but rather a by-donation, pay-what-you-can sort of event, with all proceeds going to Family and Children’s Services non-government-funded programs for older children. It began in 2013, although that year’s show was actually cancelled due to severe weather on the day of the event. Last year’s event was the first performance, and it exceeded expectations, raising an astounding $28,000. Besides “Messiah,” the concert included a short personal testimony from a former foster teen who was supported at university by the Children First Fund, the Family and Children’s Services arm that is the beneficiary of the singalong show. Having the Messiah linked to children’s welfare is quite à propos, because Handel himself performed it annually at the chapel of the Foundling Hospital in London – the city’s first home for abandoned children – from 1749–1759. It was the discovery of this historical footnote that led the Guelph agency to propose the annual fundraiser to the Guelph Chamber Choir in the first place. Another growing tradition in Guelph is the annual “Songs for the Snowy Season” performed by a trio of local female singer-songwriters. Although they now call themselves “Boreal,” that’s a convenient shorthand for Katherine Wheatley, Tannis Slimmon and Jude Vadala, very familiar names in folk music circles. They only play together in December, for the winter shows. Their program, which they released as a CD last year, is a mix of seasonal and Christmas songs, arranged for three harmony voices with minimal instrumentation. They began performing the music nine years ago, first in the intimate confines of the local Folkway Music store, and then in the larger Dublin Street United Church. Last year, they took it on the road through southern Ontario for eight performances, including one at Hugh’s Room in Toronto, a premier roots music venue. Wheatley grew up singing carols around the piano with her family, and she loves Christmas music wholeheartedly, even though some of her friends can’t stand it. “I can’t think of a Christmas song I don’t like,” she says, laughing, although she sometimes doesn’t care for the overly commercial arrangements. She doesn’t distinguish between traditional carols (her favourite is “Silent Night”) and 20th-century standards like “I’ll Be Home for Christmas,” which is on the recent CD. She loves them all. Wheatley notes that “Songs for the Snowy Season” is an easy sell in December, pre-Christmas, but they don’t attempt to perform it in January, after winter whining sets in! There’s another all-female group of singers performing a winter-themed show at the River Run Centre just a week before Christmas this year. “A Quartette Christmas” includes Elora’s Gwen Swick, who is slightly more guarded about seasonal music than Wheatley. Swick thinks “it’s easy to get hokey” (she provides “Here Comes Santa Claus” as an example), but she gets swept away by reverential songs like “O Come, O Come, Emmanuel,” an advent hymn whose origins go back many centuries. She also observes that going to a Christmas concert is a refuge from the commercial bustle of the season. The Quartette show has lots of room for “quiet musical things,” says Swick, which is a break from the frantic preparations of the weeks leading up to the holiday. Quartette is touring their Christmas show in western Canada in mid-December. Their last show before Christmas is the River Run stop on Dec. 18. I’m not sure which of the above shows I’ll attend this year. Of all the “must” traditions around Christmas — special food, decorations, lights, parties, cards, etc. — for me the most important one is seasonal music. It’s the way I experience the deeper, human and spiritual themes that the holidays are really about, and which make them accessible to all. I’m glad we have such a range of music in Guelph, even if everything happens very quickly in December. Here’s a listing to help you make your own choices — incomplete, probably, but it includes the major concerts and events already in the planning stages as Guelph Life went to press. In several cases, these shows sell out. Book your tickets early to avoid disappointment. All these venues are accessible. Carols for Christmas: Sunday, Nov. 29, 2:30 p.m., St. George’s Anglican Church, 99 Woolwich Street. Performed by the Guelph Chamber Choir. A mix of readings, carols and classical music led by a string quintet and harp and featuring a short Christmas oratorio by Saint-Saens. $25. More info and tickets: 519-836-5103, guelphchamberchoir.ca. Songs for a Snowy Season: Saturday, Dec. 5, 8 p.m., Guelph Little Theatre, 176 Morris Street. Performed by Boreal (Tannis Slimmon, Katherine Wheatley, Jude Vadala). A vocal trio of singers playing original winter music and Christmas favourites, with lots of singalong. $25. More info: borealsongs.ca. Tickets 855-772-0424, http://bit.ly/1KTW9cE or in person at The Bookshelf (Guelph) or Folkway Music (Waterloo). Guelph Symphony Orchestra Holiday Celebration: Saturday, Dec. 13, 3 p.m., River Run Centre main stage, 35 Woolwich Street. A very child-friendly concert with the Guelph Symphony Orchestra performing Raymond Briggs’ animated classic “The Snowman” (the video plays onscreen as the orchestra performs the soundtrack), plus the Battle and Snow Scenes from Act 1 of “The Nutcracker.” $35 adults, $10 kids under 17 and other discounts. More info or tickets: 519-763-3000, riverrun.ca. A Quartette Christmas: Friday, Dec. 18, 8 p.m., River Run Centre main stage, 35 Woolwich Street. This acclaimed vocal group includes Sylvia Tyson and Elora’s Gwen Swick, performing original and seasonal music. $32 to $39. More info: quartette.com. Tickets: 519-763-3000, riverrun.ca. Messiah: Saturday, Dec. 19, 7:30 p.m., River Run Centre main stage, 35 Woolwich Street. Musica Viva Orchestra on period instruments, four soloists and the choir perform Handel’s oratorio. $35 with various discounts. More info 519-836-5103, guelphchamberchoir.ca, with tickets at 519-763-3000, riverrun.ca. Singalong Messiah: Sunday, Dec. 20, 2:30 p.m., St. George’s Anglican Church, 99 Woolwich Street. Join the soloists and choir, borrow a score and sing the choruses (or just sit and listen) at this participatory event. Admission is by donation, which goes to Family and Children’s Service of Guelph and Wellington County. More info at 519-836-5103, guelphchamberchoir.ca. To donate in advance by credit card, contact 519-824-2410 or go to http://www.fcsgw.org. Andrew Craig’s Gospel Christmas Project: Sunday, Dec. 20, 8 p.m., River Run Centre main stage, 35 Woolwich Street. Guelph resident and musical impresario Andrew Craig leads this up-tempo, gospel and jazz take on Christmas music, with Toronto’s Faith Chorale and four leading soloists. This is the 10th anniversary of his infectious, spirited project. More info: http://www.andrewcraig.me. Tickets: 519-763-3000, riverrun.ca. The Nutcracker: Tuesday and Wednesday, Dec. 22 and 23, 7:30 p.m., River Run Centre main stage, 35 Woolwich Street. Performed by Ballet Jörgen in collaboration with the McMichael Canadian Art Collection and set to the traditional Tchaikovsky music, this uniquely Canadian “Nutcracker” features the vibrant works of the great Group of Seven landscape artists. $30 to $69 (discounts available). More info and tickets: 519-763-3000, riverrun.ca. This story first appeared in the November issue of Guelph Life magazine, published by the Guelph Mercury. For the magazine version see here.